Add distinctive homeware to your bathroom with our collection of bathroom accessories and bathroom decor. At Baytree Interiors, we believe that every room in your home should showcase your personality, which is why we’ve put together an eclectic range of unique bathroom accessories. Whether your home is modern or classic, there’s plenty of ways that you can add your own style to your bathroom with the right accessories. 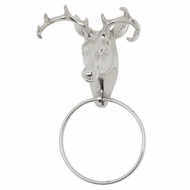 Our bathroom decor pieces are designed to become a real talking point in your home, especially our quirky stag toilet roll holders and towel rings! Put the finishing touches to your bathroom today and shop the full bathroom accessories range at Baytree Interiors. Looking for more statement pieces for the home? Don’t forget to browse our full range of kitchen accessories.